Mark Scheifele is making a case for staying in Winnipeg this season. As the first star of the game, Scheifele impressed early and often. Not only did Scheifele score the game winning goal in the first period at 16:50, he added another and set up two goals, including a beauty by Kevin Clark in the second. Not to be outdone, defenseman Paul Postma, who scored the game's opening goal, added another three assists for four points on the night as well. Also impressing were defensemen Brett Festerling, Dustin Byfuglien, and, of course, Zach Bogosian. There were many fights during the game, including Jets Patrice Cormier, Troy Bodie, and Mark Stuart dropping the mits, including a fight not even a minute in the game that included Dustin Byfulgien as well. Byulgien also added in on the offense with two assists. Andrew Ladd would cap off the evening with the sixth goal for the Jets. Ondrej Pavelec stopped 17 of 18 shots in the first two periods, while David Aebischer stopped nine of nine shots in a third period of relief work. Blue Jackets rookie Ryan Johansen scored the only goal for the visitors. After the game ended, the Jets players at center ice saluted the hometown sellout crowd of 15,015, which had been standing for the entire last minute of the game. 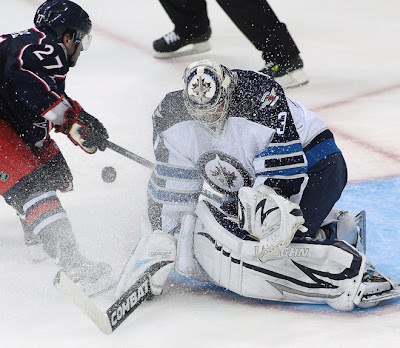 Meanwhile, the Jets were pounded 5-1 in Columbus with Evander Kane scoring the only goal from Blake Wheeler. Chris Mason stopped only 14 of 19 shots in two periods of work, while Peter Mannino stopped all four shots in the third period.